There are two types of grapes: wine grapes, derived from both European and American species; and table grapes, which are used for jellies, juices and eating fresh. 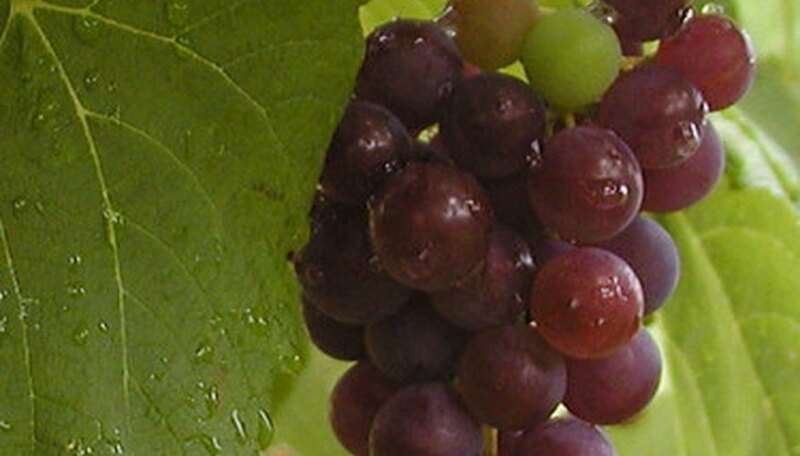 Wine grapes are found in white or blue-black varieties, while table grapes also feature varieties that produce pink-red fruits. Although grapes do produce seeds, the average gardener begins growing grapes at the bare-root stage of the grape plant life cycle and it may take up to three years of growth before ample harvests are attained. Plant bare-root plants in spring. For wine grapes, cut back all but the thickest stem to a length of about four buds before planting. Table grapes should have the bare root soaked in tepid water for three hours before placement in the ground. Both types require a hole slightly larger than the root mass. Mound soil in the center, and spread the roots over it, and adjust to allow the bare root to sit at the same height as it was in the nursery. Backfill and pack tightly, leaving no air pockets. Leave a small depression as a water reservoir. Add a 1-inch layer of compost for wine grapes; use liquid fertilizer for table grapes. Wine grapes grow in zones 4 through 9, in moderately fertile, well-drained soil. Table grapes tolerate zones 5 through 9, and require light, porous, well-drained soil, with a pH level of 5 to 6. Both types require full sunlight, good air circulation and shelter from wind. A gentle slope with a southern exposure is ideal. Plant rows north to south to maximize sun exposure. Provide a 2- to 3-foot layer of mulch to retain moisture and protect plants from winter cold. In colder climates, use clear plastic or crushed rock, which attract and hold heat better than organic mulches. Water weekly and do not allow soil to become soggy. Regular pruning is essential to vine health and productivity. Prune grape plants when dormant, before buds begin to swell. Cut all wood over a year old back to the main stem, as well as any thick or woody growth that might block sunlight from fruits growing near the main stem (for table grapes, leave 25 to 35 buds per plant). Cut back dead vines and vines furthest from the main stem on plants with lush foliage but little fruit. Fertilize after pruning. Thin out grape clusters on vines with more than 30 to 60 bunches, as soon as small grapes develop, to produce larger clusters and fruits, and to increase winter hardiness. Train new growth along supports. Pinch back new shoots that appear at ground level. Black rot disease causes grapes to turn brown and dry up. Pick and discard affected fruits to reduce disease spores being carried over next season. Fungicide may also be required. Powdery mildew causes grape leaves and vines to appear as if they have been dusted with flour. Mild infections can be treated with a strong spray of water to dislodge spores. Treat severe infections with a sulfur fungicide. Protect grapes from birds by draping netting over the vines, or by hanging aluminum pie tins from the vines, to scare birds away. Harvest grape bunches with clippers and store in a cool location. Wine grapes should be allowed to reach their full color and be fully ripened before harvesting.